What do you want in life? A fabulous marriage? Income beyond your wildest dreams? Health, wealth and happiness? To help as many people as you possibly can through your efforts? What do YOU truly want? You CAN have it all—the first step is to simply DECIDE you want to attract it! The power of decision is amazing—it puts you into motion! More importantly, it puts your higher source in motion. For me that higher source is God and Jesus Christ. For you, that might be the Universe, Budda, Allah or whomever you have faith and belief in as your higher source of power. The bottom line is that nothing is accomplished without action. As Napoleon Hill stated in the book “Think and Grow Rich”, you must be “decisive in nature!” Make a decision, don’t make a decision—have you made a decision? Of course! Can it be that simple? Yes—not necessarily easy, but simple! The word decision comes from the Latin root de-cize, “to cut away from”. We have to “cut ourselves off” from our previous path or directions to make room for the modifications and improvements necessary to attract what we really want to accomplish in life. How do I know this to be true? I’m living it daily in so many ways. Let me share some. Before my beautiful and lovely wife Peggy and I got married, we made the decision to experience a happy, fulfilling marriage and that we were going to be married forever. Both of us had previously unsuccessful marriages and neither of us ever wanted that to happen again. To insure neither of us ever had to experience the pain and consequences of an unfulfilling marriage again, we sat, talked and made a conscious joint decision that we would do what it takes to be married forever. By “cutting off” the possibility of anything other than a successful, loving and wonderful marriage, we are living that quality relationship today. In fact, November 25th was 14 fabulous years! One of the initial benefits of making that decision to be married forever was freedom it gives you. Freedom—huh? You see, by making that original decision, it frees you up from having to make certain choices in the future. Your path is already set. The first decision predetermines so many other potential decisions down the road. When you are going to be married forever, you automatically do the things necessary to accomplish that goal. More importantly, you don’t do the things that are not going to keep you happily married. That’s just a given. You put the actions in place that empower your marriage. You respect each other totally, trust each other implicitly and make sure that your actions are consistent with people that have been married forever. You show your love in all five love languages that Dr. Gary Chapman suggests including words of affirmation; giving compliments and sharing words of encouragement. You spend quality time together sharing, listening to each other and participating in meaningful activities. You give gifts as in sending flowers or other visual symbols of love. You consistently provide acts of service by doing things willingly for each other to create some amazing results. And then there is the exchange of physical touch from simple touch to greater intimacy—you get my drift? Once Peggy and I made the decision to be together forever, caring for each other up and beyond the call became standard operating procedure. God, our higher source has delivered what we have been really clear on attracting into our lives—a fabulous marriage. Not long ago, I hit the Big 5-0! With all the horror stories you hear from so many people, who would have thought it was going to be this great! I did for one—because I decided to make it great! Recognizing that I wasn’t in the best shape of my life (although round is technically a shape), I didn’t have the fitness or health plan in place that was going to allow me to do what my heart truly desires—to inspire and empower others to accomplish everything they want in their lives so ultimately they can share their blessings with so many others in need of daily inspiration. In short, I recognized it would be hard to fulfill my passions if I was dead. While that statement may be a little dramatic—it’s also very true. With that, the decision was made to improve the quality of my health and fitness—the experts were sought out—the guidance was put into place—the plan was executed—and I’m on my way to total lifetime fitness. In only eight months, I lost 77 pounds of fat, gained 12 pounds of muscle for a 65 pound net weight improvement. Please understand, I never went out to lose weight, I went out to be fit the rest of my life. That decision leads to acting and doing the things fit people do. By the way, I have maintained and actually improved my fitness since. The exciting byproduct of becoming fit is you lose weight because you workout like fit people workout, you eat like fit people eat and you care for your body like fit people do. My energy level has sky rocketed and more importantly, I have become an inspiration to at least 50 plus close friends that figured out that “if I could do it, they could do it too!” One last fabulous byproduct of becoming fit beyond feeling great is that my beautiful wife Peggy is feeling even greater pride in our relationship (and from what she has said) and I’m looking better than I did when I was 30. You simply cannot and will not lose weight or get better into better physical shape until you first decide to do so. Once that decision was made, higher source supported my desires by putting everything into action and started delivering the resources necessary to accomplish greater health and fitness. Again, is it easy? Maybe not easy but it is simple. Decisions give you the information necessary to set your inner guidance, your internal GPS device on where you want to go. Whether inner guidance—or a GPS system—they know where you are—and how to get you to where you want to go—after you decide your destination and plug it in. Let’s look at the financial realm. Less than 6 years ago I was dead ended in a corporate job that anyone would love to have had. As the Vice President of Sales and Marketing for a company, I ran the sales force, created the programming and ran the vast majority of the company. The problem came that the harder I worked, the more work I created for myself—and didn’t get paid anything additional. Sound familiar—making a decent living and really being able to do it spinning the position on your finger like a plate—but not really being fulfilled or making the impact in the world that matched the talents GOD gave me. The decision was made to follow my heart and passion to become a professional speaker, author and “street-wise” sales consultant. This also allowed the talents and capabilities GOD blessed me with to be used to a far greater extent. What a great feeling to share those talents and the knowledge I have learned from my mentors that have shared it with me. Combining that knowledge with my own experiences, the desire to constantly be learning and my efforts on the street, I have ultimately been able to help so many others. Now that’s fulfillment! An amazing thing happens when you follow your heart and passion—the rewards for your efforts seek you out! In less than 6 years I have written 7 books, have 2 more in process, have spoken over 3,500 hours on the platform—and oh yeah—my income has quadrupled! 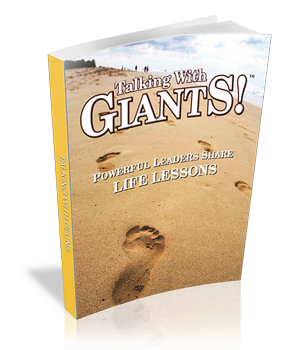 The true joy in this success is launching Talking With Giants! Powerful Leaders Share Life Lessons in 2007. TWG is the work that came out of my morning proclamation: I am attracting into my life everything that I need to cause over $100 million in Charitable Giving! As I developed that proclamation a number of years ago—I had no clue how that was going to happen. But as I say in my presentations—When you have a big enough WHAT—and you have a strong enough WHY—the HOW shows up! You can attract everything into your life you desire once you gain clarity and release it to your higher source to fulfill. 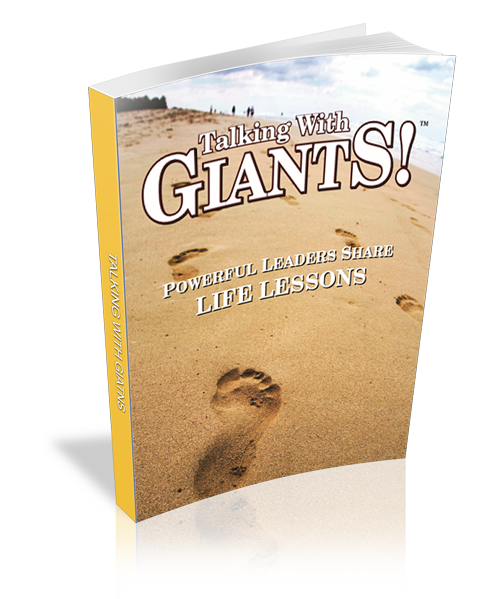 To help accomplish your goals, please visit www.TalkingWithGiants.com to learn about the 21 charities supported by the first book alone. I don’t share any this to impress you but rather to impress upon you that you too can have anything in life you desire once you make the decision to attract what you truly want. Obviously you have to take other actions after the initial decision to accomplish these wants and desires. The exciting part is that by taking this first action—making a decision—you put higher source into motion towards accomplishing your goals. One thing is abundantly clear, without first making the first decision, nothing happens. Live the life your dreams and imagination—decide to go for it and attract the very best life for you!